Easy to Use Weekly Undershelf e-pill Accutab Pill Dispenser (non-electronic) from e-pill Medication Reminders. Dispense medications, vitamins, supplements: 1, 2, or 3 times per day for One Week. 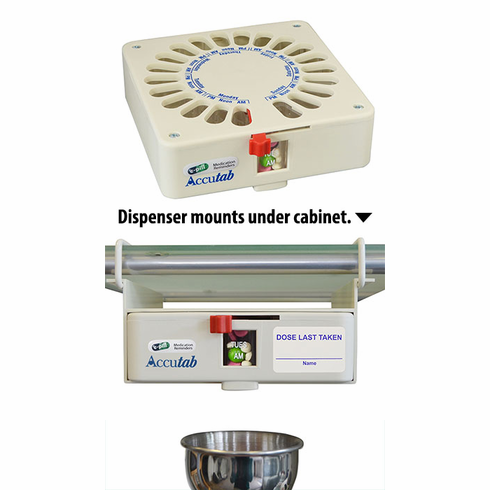 Fill your e-pill Accutab automatic pill dispenser and simply slide the included bracket under your kitchen cabinet shelf & you are ready to dispense (SKU 820654). Weekly e-pill Accutab automatic pill dispenser simplifies taking multiple medications and/or vitamins. Large Pill Capacity. Holds lots of Medicines and Vitamins. Undershelf - Fits under kitchen cabinet shelf with included wire bracket. NO Installation - Simply slide the e-pill Accutab in place. EASY to Dispense. Simply slide lever to auto rotate dispensing tray. Medications and Vitamins drop into patient's hands. Combine Accutab Automatic Pill Dispenser with an optional e-pill Medication Reminder alarm timer. Learn More about the e-pill Accutab 7 x 3 Weekly Pillbox Automatic Pill Dispenser for Medicines and Vitamins. Easy-to-Use Under Cabinet / Under Shelf Pill Dispenser Vitamin Organizer. The e-pill Accutab Vitamin and Pill Dispenser Under Shelf version takes the work out of organizing weekly medications. Dispense medications, vitamins, supplements 1, 2, up to 3 times per day for One Week. The e-pill Accutab Under Shelf also helps with pill identification. | Classic e-pill Accutab Pill Dispenser (Mounts under your Kitchen Cabinet). Accutab an innovation in medication control: The e-pill Accutab Under Shelf Pill Dispenser is making hard to open bottles and awkward plastic pillboxes a thing of the past. The e-pill semi-automatic Accutab pill dispenser is easy to use and simplifies the task of planning for multiple doses of several medications and dispenses the correct dose with ease. The dispenser can be loaded weekly by an individual or caregiver, dramatically enhancing on-time, correct dosing of medications. Accutab is loaded once a week by the user or caregiver. 21 compartments that are larger than most pill boxes. No installation required: Simply slide the included bracket on your kitchen cabinet shelf or bathroom shelf. Capacity: High Pill Capacity. 25 (twenty-five) aspirin sized tablets in each compartment. 3 (three) compartments per day for one week. Easily holds large vitamins, supplements, and prescription Rx / OTC medicines. 21 total compartments (7 days x 3 doses per day). Clearly labeled 'Day of the Week' and 'AM', 'Noon' and 'PM'. Size: 6 3/4 inch x 6/3/4 inch x 2 inch. Mounting bracket 8-inch x 6 1/2 inch (needs 8-inch total depth for mounting) x 3 1/4 inch. Mounting: Under Shelf. Slide on shelf mounting wire bracket included (no installation required). Refill once-a-week on Sunday night or use Two (2 Accutab (one pre-filled) and do a change-over on Sunday. Great for large Vitamins and Herbal Supplements.